Aunt Kate, who will be 100 on November 22, 2017, used to be a gambler. Not regularly, but often enough so the casinos and hotels used to send her special offers and discount coupons. Her older sister, my late mother, disapproved mightily and used it as another excuse not to send Kate much money on her birthday or Christmas. I think the casinos were mostly in nearby Reno, not Las Vegas. Probably they don’t have casinos in Reno like Mandalay Bay, although lots of people there do pack guns. One day, clearing an upstairs closet, I decided to cart off the lapsed laptops and tangles of old phones and chargers to a recycling yard. This led naturally enough to reconsidering the problem of Aunt Kate’s pistol, which I had stowed deep in that same closet. Sometimes I forgot that the gun was still there, in its padded camouflage-print case, tucked inside a white bag decorated with a flag and the logo “Proud to be an American,” the whole stuffed inside a larger blue bag advertising a Berkeley oral surgery clinic. When I did remember, I just couldn’t decide how best to get rid of it. Aunt Kate had been living alone in the Sierras for twenty years when I had to help her move to a nursing home. By then she knew most of the neighbors on her road; summer people with boats and gas barbecues, and many year-round, like her, sometimes sharing snowplows, woodpiles, and apple harvests. That sounds pleasantly communal, but in my experience mountain people are more often than not a bit off-kilter. Kate’s nearest neighbor, who had bought land from her original parcel, also had a share in her well and the spring, and he did not like the feckless way she watered the plants on her property, or the spewing fountain she had installed amid her daffodils. He put up a no-trespassing sign that she could see from her kitchen window, and a barbed wire fence with fiercely yapping dogs behind it. What this had to do with drought or riparian rights was unclear, but it definitely wasn’t friendly. A paunchy guy in a baseball cap, he liked to patrol his property line in a sort of souped-up golf cart. Kate did threaten to take action if he should ever emerge from behind the fence. I don’t think that she would have shot him, but she did have a hot temper, and she owned that gun. About that time, I happened to watch Ken Burns’ Roosevelt epic. FDR and Eleanor were major icons in my family, but not so Teddy and his strenuous ways and words. “Aggressive fighting for the right is the greatest sport in the world,” he said. The Spanish-American War of 1898, that “splendid little war,” only lasted ten weeks, but some have seen it as the end of the Spanish Empire and the beginning of the so-called American century. 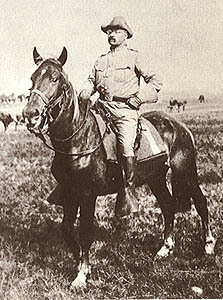 In any case, the image of Roosevelt charging up and down San Juan Hill on horseback (amid the foot soldiers) eventually got him to the White House. 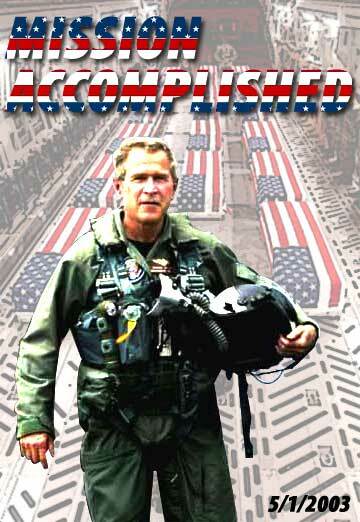 Another such image comes to mind, of George W. Bush, in 2003, fully kitted out in a flight suit on the deck of an aircraft carrier flying the banner “Mission Accomplished,” and declaring the Iraq war over, a bit prematurely. Still, another kind of visual embarrassment attached to the bombing of a hitherto unknown terrorist menace in northwestern Syria. The defense department announced the assault, providing a colorful but vague map that was astutely deconstructed by Daniel Brownstein. 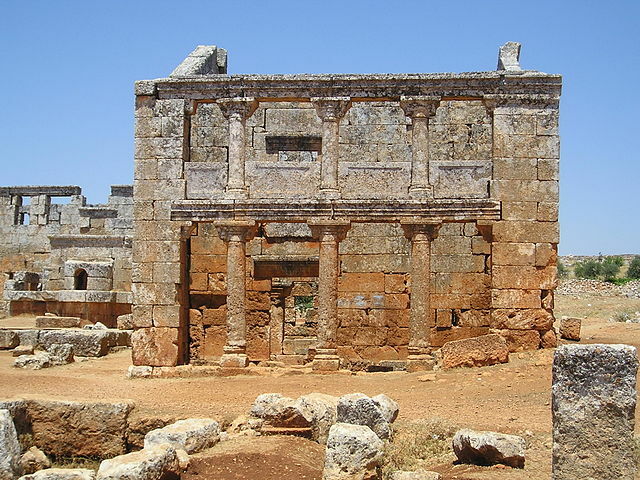 Looking at that map, you would never know that the cluster of eight bombings probably devastated the Ancient Villages of Northern Syria, coincidentally eight in number, UNESCO sites with well-preserved remains of Byzantine and Christian settlements from the first to the seventh centuries. Built of stone instead of wood, the remnants of these villages make the tarted-up ghost towns of the American Wild West seem fairly pathetic. The Sierras are full of Gold Rush ghost towns, and my aunt Kate used to like to visit the one nearest her, of which little was left but an old hotel with a mahogany bar and a big mirror adorned with antlers and a couple of fancy old rifles. One summer night, warm for the Bay Area, a visiting friend was asleep in the upstairs room with the crowded closet described earlier—but long before I deposited Aunt Kate’s revolver there. The police arrived and cordoned off our block with yellow tape and a row of squad cars. We were deposited at the police station, where we sat barefoot in our nightclothes, waiting to be told what was going on. The intruder had decided to dig in. He threw various items out the upstairs window onto the street—bags holding kitchen knives and fridge photos—and announced his demands to the police below: to be given possession of our house and the Toyota in the driveway, and to be admitted to the University of California. This was 1992, shortly after the Rodney King riots in Los Angeles, and the Berkeley police were being very, very careful. Eventually, towards dawn, the intruder opened our front door, walked to the driveway with the car keys in his hand, and was immediately arrested and subdued. Later it emerged that he had taken a bath, donned some of our clothes, and believed that he was therefore invisible. He was unarmed, had only been faking a gun barrel with an empty prescription medicine vial. His father flew out from Baltimore, where the son had gone off his medication, to take him home. We were grateful that nobody had been hurt and the house was more or less intact. That was a long time ago. I managed finally to turn in Aunt Kate’s pistol at the Berkeley police station near City Hall. The young officer asked if I was willing to have the pistol used in police cadet target-shooting classes. I guessed that hey would have bought another if I had said no. Aunt Kate’s revolver was probably manufactured sometime between 1986 and 2010, a period when U.S. small-arms production included over 98 million pistols, revolvers, rifles, and shotguns—for domestic sale alone. Would this total include firearms promised and/or delivered by the U.S. to the “moderate” Syrian rebels, “vetted,” of course? Or perhaps they would have been incorporated in export figures. Possibly, arms shipments “secretly” authorized by Congress would not figure at all in production totals? What about drones? So many questions. 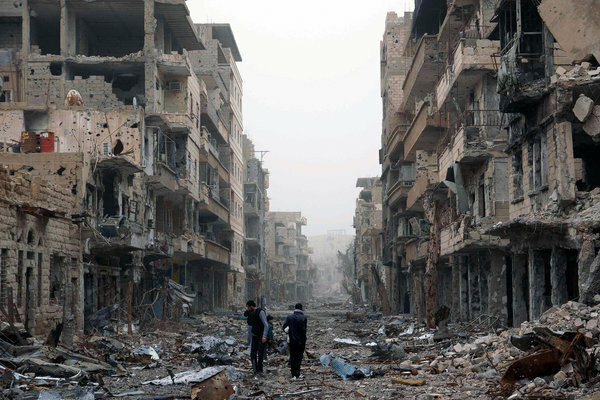 Some say that if the U.S. had armed the rebels in Deir ez-Zor, the town would not have fallen to ISIS. Some say that ISIS is using U.S. weaponry it has taken from rebels it has “pacified.” Whichever account is correct, the results are essentially the same. We all know that statistics are fungible according to their source. But information from every source imaginable shows that the U.S. is far and away the largest producer of arms in the world. Domestically we have about nine guns for every ten citizens, a total of about 270 million. How many wars worldwide are being waged with U.S. weaponry (if not with U.S. boots on the ground)? That folksy expression “boots on the ground” dates from General William Westmoreland and the United States’ misadventures in Vietnam, so painfully documented by Ken Burns and Lynn Novick. On the other hand, military research has, rather famously, given the civilian world the Internet, and GPS. Current DARPA (Defense Advanced Research Projects Agency) projects include the mother of all recycling programs, re-use of retired satellite parts into new “on-orbit assets.” DARPA has in the past been known as ARPA, omitting the “Defense” for political expediency. One year its name was changed and changed back three times. DARPA, through its MANTRA program (Materials with Novel Transport Properties) is also working on a portable desalinator that will allow troops in the field to transform salt water into fresh water. A very small percenage of our planet’s water supply is drinkable freshwater, which can pose problems for a military which must deploy to the far corners of the earth when the president and/or Congress say so. These areas are often hot, sandy, and subject to drought. However, lack of fresh water in those far corners is in the long run more problematic for the local peoples than for U.S. troops, who eventually get to go home. Might there be an algorithm connecting occasions for foreign military intervention with places where drought and poverty are endemic? Could DARPA (through MANTRA) produce larger, if somewhat more cumbersome desalinators, to make such sweeping improvements in a country’s standard of living that our troops—or any others—might not even be needed? One of the earlier cases of military research directed to civilian uses must be Galileo’s early promotion of his telescope as a useful instrument for the notably martial Venetian Republic. 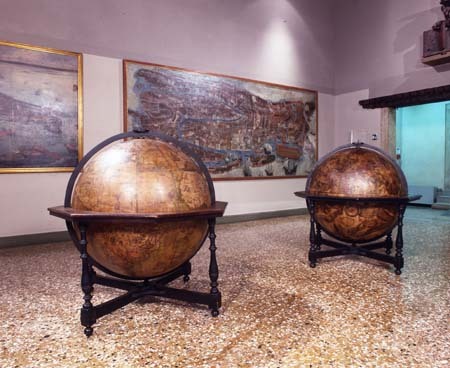 The Venetian arsenal and naval museum testify further along these lines, and the richly detailed globes at the Correr Museum were very much imperial instruments as well. 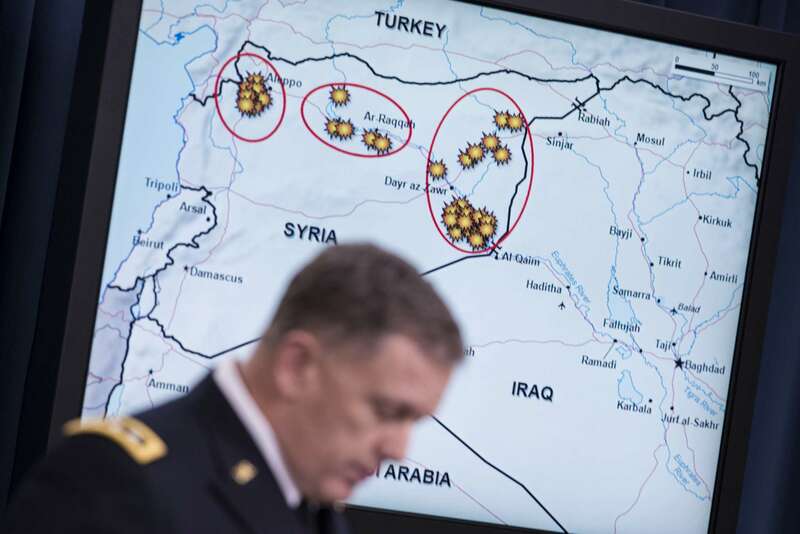 From the looks of their Syrian maps, the U.S. Defense Department couldn’t produce anything similar. December 14, 2012: Sandy Hook Elementary School in Newtown, Connecticut. Twenty-year-old Adam Lanza on a rampage through the school killed twenty children and six adults. Before heading for the school Adam Lanza killed his mother, a gun collector, in her bed. For 15 -24 year olds, the ﬁrearm homicide rate in the United States more than 40 times higher than in other developed countries. How much is this due to the increased availability of guns across our fruited plains? The US has the highest gun ownership rate in the world – an average of 88 per 100 people. Yemen, at Number Two, has 54.8 per 100 people. Arms possession doesn’t seem to have improved the national welfare in Yemen either. The nation watched the funeral for the Newtown dead and grieved, as it will watch the funerals after the Las Vegas slaughter. After Newtown, President Obama wept and vowed reform. But within a few months, the Assault Weapons Ban bill and the amendment to expand background checks on gun purchases were both defeated in the Senate. It seems highly unlikely that the killings will cause President Trump to promise any gun reform, but he’s very sad about this manifestation of “pure evil” at Mandalay Bay, a casino with which he has no connection. The Andrew Cuomo administration passed a strong gun control act a month after the Newtown tragedy. But soon thereafter, 52 of New York’s 62 counties passed official resolutions in direct opposition to control of assault weapons. Not only did the gun lobby defeat any gun law reforms, but they helped recall two Colorado lawmakers trying to firm up that state’s gun regulations. New laws now let people bring guns into bars, churches, and college campuses. Schools around the country have hired armed guards. There’s more security apparatus in public places, not just in airports but in shopping malls and football stadiums. California’s senior senator Dianne Feinstein gave her all to get the Assault Weapons Ban passed in April 2014. When it failed, she said that it now fell to the states to take up the issue of gun reform. That month, another unbalanced youth killed six students and himself in Santa Barbara, California. This resulted in a successful campaign to strengthen California’s gun control laws, which have already been described as the strongest in the nation. Aunt Kate’s Heritage little revolver probably came with a complementary one-year membership in the N.R.A. It’s a curious fact that the National Rifle Association was not founded to fight for so- called constitutional rights to own and use guns. The NRA was founded in 1871 by two Yankee Civil War veterans, including an ex-New York Times reporter, who felt that war dragged on because urban northerners could not shoot as well as rural southerners. Its original purview was “Firearms Safety Education, Marksmanship Training, Shooting for Recreation,” the motto displayed in its national headquarters. The NRA actually went on to help to write many of the federal laws restricting gun use in the 20th century. In the 1920s and 1930s, the NRA’s leaders helped write and lobby for the first federal gun control laws—the very kinds of laws that the modern NRA now opposes. Only after a leadership coup in 1977 did the NRA become a powerful political force operating on the premise that more guns are the answer to society’s worst violence. The NRA advocated arming commercial airline pilots after 9/11 and teachers after Sandy Hook, while opposing new restrictions on gun usage. Why am I fixated on Aunt Kate’s little pistol? (22LR & 22Magnum cartridges, genuine cocobolo grip). My own spouse still has, salted away somewhere, a few of the antique rifles that he collected as a boy. Of all the guns in the world, Aunt Kate’s is the only one I have been able to take out of circulation. By Frances Smith Starn in Uncategorized on October 21, 2014 . The NRA, long interested in cultivating its membership, not only sponsored the marksmanship medals awarded in my summer camp–itself run by pretty much by Quakers. Sponsorship included offering pretty much anyone with the slightest skill the possibility of aone-year memberships. interesting. how the good guys in NRA lost it and let the bad guys rule! Francie is a very elegant writer. this is worth reading.